Once you start depending on the F5 BIG-IP to deliver your applications you will soon ask yourself: How do I view and delete the current or active connections through my F5 Load Balancer? Answering this question helps get your head around the concept that the F5 BIG-IP is a Full Proxy, and for that matter, much more than a load balancer! Many of us first become familar with F5 through the Local Traffic Manager, aka LTM – handling much of the local load balancing, but that’s just the start. From advanced DNS, Authentication & Identity, to advanced security and Web Application Firewalls – the BIG-IP has matured into the enterprise standard for delivering vital applicaitons. F5 being a full proxy has two sets of connections, both with their own Client Side, and Server Side respectively. You’ll find this command is indespensible, not only with the LTM, but with other core modules like the AFM, DNS/GTM, APM, and ASM. Lets dive into the TMSH command to display and delete connections with an F5 bigip. Note – viewing and deleting connections is currently not available in the GUI. tmsh show /sys connection ? This file is placed in /shared. This allows to write a file larger than 2GB. You can see there are plenty of useful options and properties you can choose from, now lets take a look at some of my terrible art work. The drawing will help explain where exactly in the connection flow they live. This drawing depicts a BIG-IP in Full-Proxy mode where the client is the initial source of the communication to a VIP on the Client Side, and the F5 is using SNAT to route traffic destined to the server on the Server Side. I've labeled the respective parts of the drawing with the equivalent "show /sys connection" property. One of the most important things in understanding TCP/IP communication is understanding who "initiated" aka "sourced" the connection - with the BIG-IP we take it a step further and aim to understand who was the "initial" source. 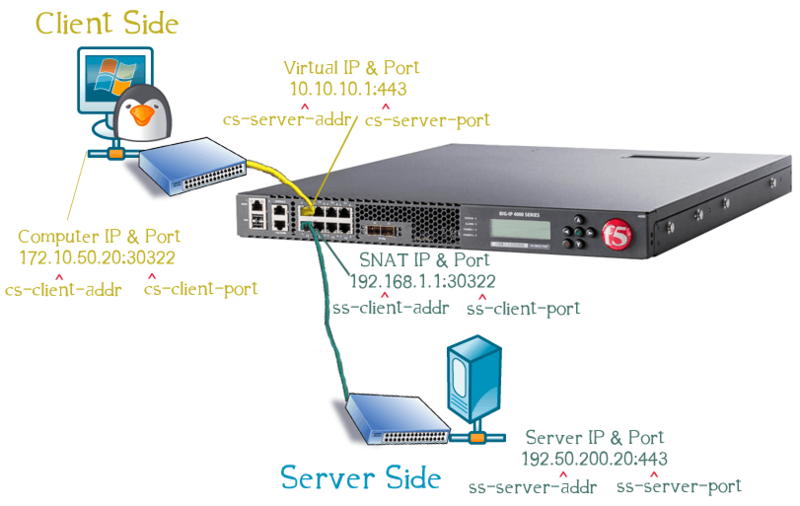 In this example the computer is the initial source to the BIG-IP VIP, and the VIP proxies the connection to the backend server "sourcing" communication from the SNAT address, destined for the Server. The context doesn't always have to be that way, for example, the Server could initiate a connection, and now in relation to the connection table, it's the client side client address or cs-client-addr. The F5 could also initiate communication - one good example is monitor traffic from the non-floating self IPs. Fortunately the output of the connection table always lists the initial source on the left side as the cs-client-addr. TIP - In general with TCIP/IP you can often tell who sourced a connection by looking at the ports, whoever is initiating a connection is typically going to use a port greater than 1024 for itself, and will usually go after a well known port like 80 or 443. How do I delete a connection from the F5 BIG-IP connection table? TMSH command to delete ALL connections in a F5 BIG-IP  - Careful, you're going to kill EVERY session. Thanks for the article, what is the show sys connection age does? what it refers age basically? Is there a way to get this information trough the GUI? Unfortunately there is no way at this time to view detailed connection data like this from the GUI -though it would be nice! Thank you for your great article, you helped me a lot! Thanks for the contribution Petee! Yes, specifying both client side ports should do the trick to delete the single connection – nice tip! You have a very unique way of explaining technical information that make it sticks with me, keep writing! Thank you so much for the article, Wonderfully put, I would also like to know a few live cases where we will actually need to delete an active connection. Thanks Racker, so Why and when would you need to delete connections in F5 land? For the most part, when you make changes to a Virtual Server and its’ associated elements, the changes do not effect current connections. This can confuse you and the folks impatiently hitting refresh expecting the changes to take effect immediately. This means we have to delete the current connections to that VIP in order for them to establish new connections and utilize the new settings.